Description of "Study of Carbohydrates (eBook)"
This is a Detailed Study Guide of Carbohydrates, a part of study in Organics of Chemistry. This Book is a handy guide for study of Carbohydrates for all College and University students of Under-Graduate Level. Some parts of the contents has been written by understanding different sources which are reliable & authentic. Bishal Baishya is a person specialised in Applied sciences in the field of Physics & Chemistry. He is a simple boy with simple mind who wants complex knowledge to be really simple. He has authored a few books that include "The Study of Carbohydrates: A Detailed Guide". He has a good experience in writing Scientific Articles and have written many short books on it. He has a good compilation of Authentic scientific documents, some of which were never made public. His Books are simple, easy to Read but Highly Detailed though while understanding the reader feels that he/she read a Novel. 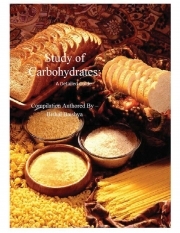 Reviews of "Study of Carbohydrates (eBook)"
Really A good book in terms of Knowledge present on the topic. Easy to understand, Well Detailed & well Illustrated, though the topics are in detail. A perfect book for College & UG Level university students.